JDB Home Improvements is experienced in multiple roofing systems. JDB is a 5-star master shingle company. Becoming a 5-star master shingle company requires commitment to professionalism and dedication to quality craftsmanship that few other roofing companies demonstrate. Choosing a master shingle company ensures the contractor as well as the team is more knowledgeable in proper roofing methods and years of experience you can trust. 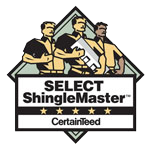 A master shingle company agrees to abide by a code of ethics that covers compliance with applicable laws requiring high standards of workmanship, customer satisfaction and business administration. JDB Home Improvements is committed to upholding industry accepted standards and business practices. 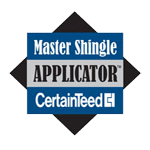 JDB Home Improvements is the only 5 Star Select ShingleMaster for Certainteed in the area. JDB has met the most stringent credential requirements in the industry. Your roof will be covered by the strongest warranty & we stand behind the Certainteed 25 year workmanship warranty when you select the 5 star warranty coverage. Your roof is the most important entity to protecting the inside of your home from the outside environment. We are dedicated to keeping you dry and protected because what is inside your home is priceless. You can call us anytime and a response team will be at your home soon. The JDB team has trained experts in repairing storm damage. Call the JDB emergency phone number. We will come and waterproof the damaged area and take pictures for insurance purposes if needed. The JDB team are experts in handling STORM DAMAGE CLAIMS with insurance companies. The proper steps are taken to keep you stress free during the most unpredictable moments. Beware of storm chasers. WE GUARANTEE AND HONOR OUR WORK LONG AFTER THE OTHERS HAVE LEFT. JDB Home Improvements will work alongside with you and your insurance company to get your needs taken care of quickly & efficiently so you don’t have to worry. JDB will help with any questions you or the company may have.